Soapworld Heavy Duty Cleaner is a concentrated cleaner ideal for cleaning and degreasing in heavy-duty areas where high pressure cleaners are required. Alternatively use a spray bottle for best results. 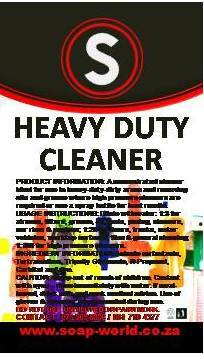 USAGE INSTRUCTIONS: Dilute Soapworld Heavy Duty Cleaner with water: 1:3 for aircons, filters, grease, oil spots, paving, showers, car rims & engines; 1:20 for floors, trucks, motor vehicles, worktop surfaces, tiles & general cleaning; 1:100 for high pressure cleaners. INGREDIENT INFORMATION: Anionic surfactants, Tertrasodium, Tripolly Gluconate, N-Propanol, Carbitol and dye. DO NOT USE UNDILUTED ON PAINTWORK.